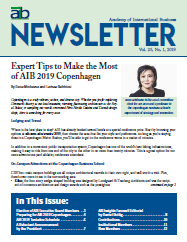 Designed to inform members of important information relevant to the AIB and the field of international business, the quarterly AIB Newsletter (ISSN: 1520-6262) provides feature reports and news articles. Information on upcoming events such as conference announcements, calls for papers, and publishing opportunities are also featured. The AIB Newsletter reports on the activities and events of the AIB chapters as well as milestone achievements of individual members. It is also an important source of information for academic position openings. The Newsletters are in PDF format, therefore you must have Adobe's free Acrobat Reader software to be able to read them. AIB President’s Letter from Alan M. Rugman; Call for Volunteers for AIB Chapter Relations Committee; Call for Proposals JIBS Editor-in-Chief; In Memoriam, Neil Hood; Call for Papers for AIB US Midwest Regional Conference; News from our Members. Letter from Mary Ann Von Glinow, the 2006 Program Chair; AIB 2006 Beijing Conference Related Announcements; Call for Proposals for 2006 Emerging Frontiers Conference; Recognition of Donors and Institutional Members for Calendar Year 2005; Introduction of 2006-2008 Executive Board; News from our members. Letter from the President Alan A. Rugman; Third Annual JIBS/AIB Paper Development Workshop; Junior Faculty Consortium; Doctoral Consortium; In Memoriam Franklin Russell Root; WAIB Installs 2005-2007 Executive; New AIB Members; Just off the Press; Members on the Move. Letter from the Executive Director G. Tomas M. Hult; Record Attendance in Quebec! ; 2005 Program Committee; AIB 2005 Awards; Area Scholarships; Doctoral Travel Stipend Winners; SAMS Doctoral Consortium Stipends; Call for Papers: Beijing, China; New AIB Members; Just off the Press; Members on the Move. Letter from the President Alan A. Rugman; Letter from the Program Chair Yves Doz; An Afternoon Stroll in Quebec City; AIB Pre-Conference Teaching Roundtables information; Award Nominations; An Overview of the 2005 AIB Annual Meeting; Select Results from the October 2004 Member Survey; John Fayerweather Remembered; Call for Papers annoucements for both the Midwest AIB Conference and a focused issues of JIBS; Just off the Press; news for members; and a Request for Proposals for AIB Annual Meetings for 2008-2010. Letter from the Executive Director G. Tomas M. Hult; A. Edward Safarian Honored at Conference on "Governance, Multinationals and Growth;" announcement and call for papers for the 3rd Annual JIBS/AIB/CIBER Conference on Emerging Research Frontiers in International Business; updates on the 2005 AIB South East Asia Conference; call for papers for the JIBS focused issue; and news from the members. Letter from the New President Alan M. Rugman; highlights from the record-breaking-attendance 2004 meeting in Stockholm, Sweden; 2004 AIB awards; and news from the members. Update on the 2004 meeting in Stockholm, Sweden; an update letter from the new Executive Director; information on literature reviews available on jibs.net; report from the 2003 AIB-US Southeast Chapter Annual Meeting; and news from the members. Information on move of 2004 meeting to Stockholm, Sweden. Also, a reminder on the transition of the AIB Executive Secretariat from the University of Hawaii to Michigan State University. Features photos from the 2003 Conference in Monterey! Also announces the transition of the AIB Executive Secretariat from the University of Hawaii to Michigan State University. A countdown to the AIB 2003 Conference in Monterey; the Quarter 2 newsletter includes a preliminary conference schedule. The 2003 Quarter 1 newsletter includes a description of the Monterey area - home of the 2003 Annual Meeting. Other highlights include an article on the newly established AIB India Chapter. The 12-page newsletter contains a feature article about book reviews available on www.jibs.net. The issue also contains Chapter Conference announcements for the UK, USA-SW, and USA-MW Chapters, and Conference briefings from our Chapters in Southeast Asia and USA-NE. 2002 Quarter 3 newsletter features highlights of the successful 2002 AIB Meeting in Puerto Rico (photos and story). It also welcomes the incoming Executive Board. Information about the Puerto Rico conference, as well as Chapter news. Information on the upcoming conference in Puerto Rico as well as the results of the recent Executive Board election. 2001 Quarter 4 covers the fabulous meeting in Sydney with pictures. It also includes Insights, which provides commentary on the events of September 11. Mailed with a copy of the 2001 Advance Program, the Quarter 3 newsletter contains meeting info and the second edition of AIB Insights. Features the first ever issue of AIB Insights. Includes information on Sydney and Puerto Rico - the sites of the 2001 and 2002 AIB meetings, as well as the JIBS online web site. Includes highlights of the Phoenix meeting and the text of the Presidential Address. Includes a feature story on the new AIB Web site as well as the 2001 Sydney Call for Papers. Contains information about the 2000 Phoenix meeting as well as Excerpts from Ray Vernon's Thoughts in JIBS. Coverage of the 1999 AIB Annual Meeting in Charleston, South Carolina, and the Call for Papers for the 2000 Meeting in Phoenix, Arizona. Includes an article on Charleston, "The Best Kept Secret in America", and an Article by Alan M. Rugman (University of Oxford), in memory of Ray Vernon. Highlights the various activities available in Charleston, South Carolina, location of the 1999 AIB Annual Meeting. An invitation to the AIB's 1999 Annual Conference: The Janus Face of Globalization. A recap of the 1998 AIB Annual Meeting in Vienna, Austria, and Call for Papers and other information on the 1999 Meeting in Charleston, South Carolina. "Hofstede to preview joint research" - in the upcoming 1998 AIB Annual Meeting in Vienna.